Best fruit pizza ever is just that! The crust is so delicious, you may have a hard time stopping at one slice of this amazing fruit pizza. You better just leave all of the slices for me! Ha ha. I just couldn’t wait to post this delicious best fruit pizza ever. The berries are perfect this time of year and since it is time to get together with family, I decided to go for it and make this totally amazing dessert. I hope that you enjoy it as much as my family does. If you have someone that needs a pick me up, this is the recipe to make for them. They will love you forever. The fruit on it can make a bright ray of sunshine, and the taste just says “I love you”. Oops, maybe I should have made it for Valentine’s day. I think anytime of year is a great time to make best fruit pizza ever, if there is some yummy fruit to put on it. The sky is the limit. I just do not recommend those fruit that they call fruits like tomatoes, or avocados. My friends, just stick to the berries, mandarin oranges, apples would be great right before serving and even a banana. However the bananas do not last very long unless you put a little lemon juice on them, and so you might just want to stick to putting them in banana bread. I have been making a quilt for my cute little grand daughter. I already made one for the other grand daughter. I am loving how it is turning out. I have used bright colors like orange, yellow, purple, green and blue. The quilt has cute spring time things like flowers and bunnies. I then made pinwheels in the bright colors and I cannot wait to get it finished. Then I am going to put some soft orange fabric on the back. That is one thing that I love about quilts, you can come up with your own recipe. And different than a recipe, you can’t go to wrong with a quilt. If you do not love it, you do not need to throw it out, you can still use it to give you love and to keep you warm. I hope that each of my grand kids will love their special quilts and keep them forever. And I do not know about you, but where I live, it is raining. A LOT! But everyone’s grass is so green and beautiful. It is a little chilly around here; still sweatshirt weather, but I know that spring will be here soon, just look at all the gorgeous flowers everywhere. Other things that I have been up to are, my sweet neighbors’ dog got hit by a car the other night. I feel so bad because her dogs are just like her babies. He was a special breed of dog and I know that she paid good money for him. So what can you do for someone who is feeling down and out? You just might want to make them basic white bread. That is what I did, because what else can you do? And there is just something comforting about homemade bread. 1- I used a rolling pin to make the dough nice and smooth. 2- Make sure that you refrigerate any left over pizza. 3- For a big crowd, double the recipe and bake the dough in a cookie sheet! In a medium bowl, combine the butter, flour and ¾ cup powdered sugar. Then put the dough onto a pizza pan or a 9" x 13" cake pan. Bake the dough for 6 minutes. 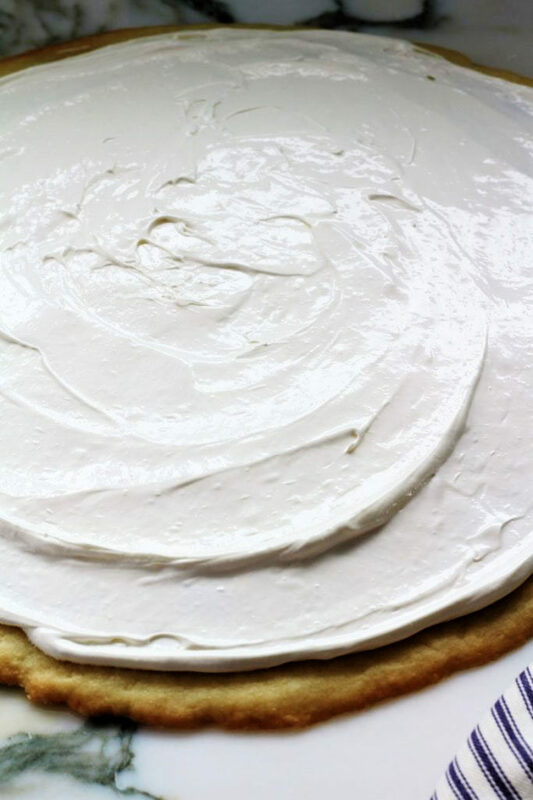 Mix the cream cheese, whipped topping and the 1½ cups powdered sugar. Spread this filling onto the crust that has cooled. Then add any fruits that you enjoy, on top of the cream cheese layer. Some that we really enjoy are kiwi, strawberries, mandarin oranges and blue berries. You may want to double the recipe and put the dough in a cookie sheet to bake. 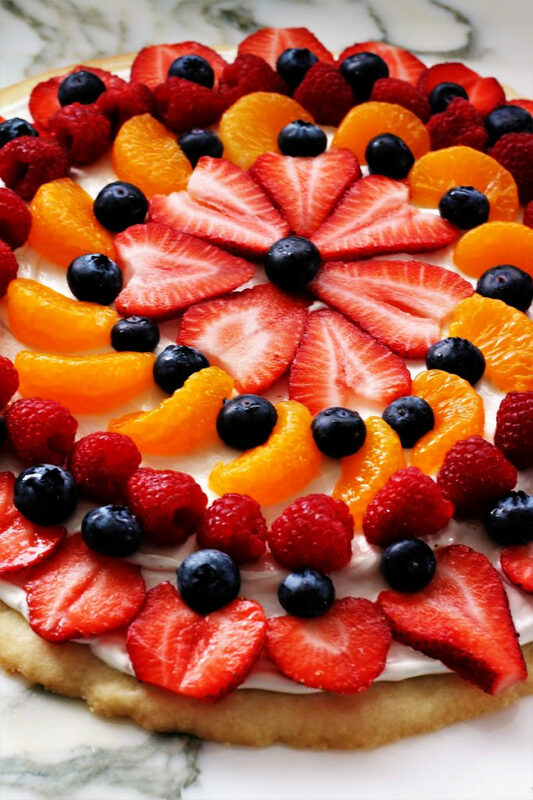 This fruit pizza looks fantastic! I love the fun colors of all the different fruits! Thank you Rachel. I love this time of year with all of the yummy berries that are out! 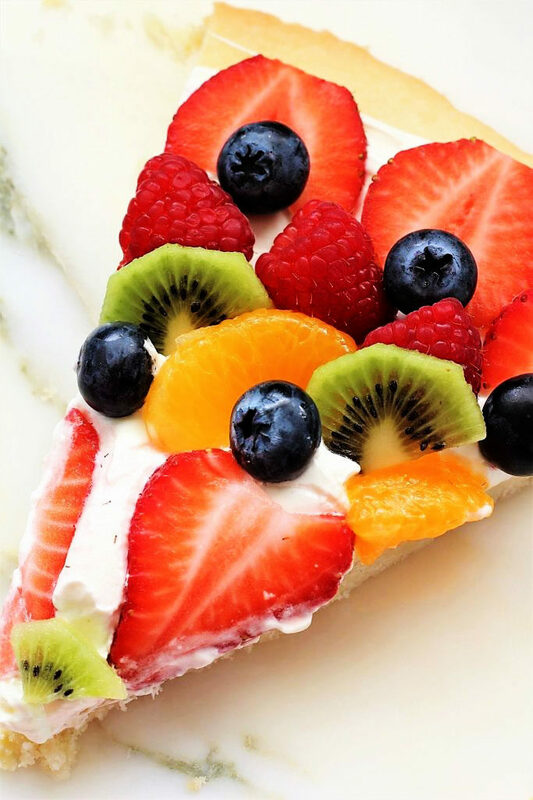 And this fruit pizza was perfect for spring! 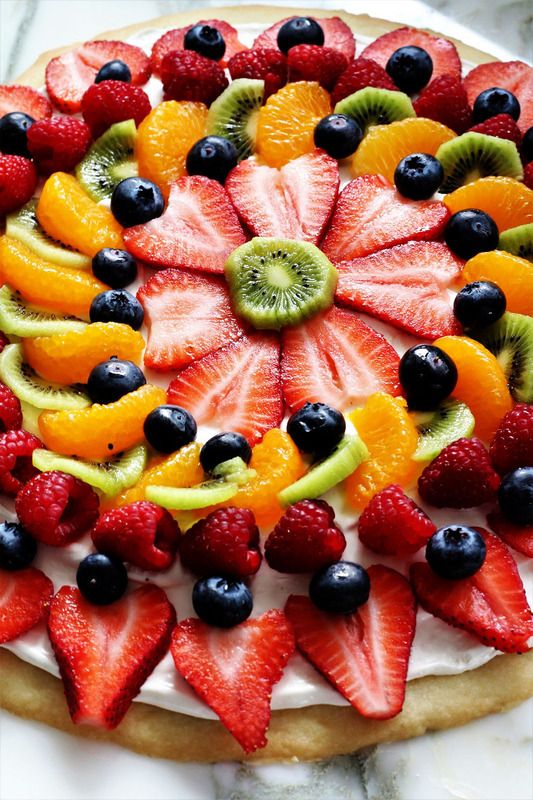 This fruit pizza looks like the perfect way to eat fruit hehehe. Perfect for a party! You are so right! I think the crust is the best crust I have ever eaten on fruit pizza. Have an awesome week end Kelly! I love fruit pizza but can you believe I’ve never made one? Yours is beautiful and I can’t wait to give it a go!